All our orders are shipped vide reputed courier providers like Fedex, First Flight, Aramex etc. At the moment, we ship only within India. In case you are an international customer, pls. get in touch with us on info@atun.in and we will guide to the most convenient local retailer that you can order our products from. We normally ship all orders within 2 business days of receiving your funds. Thereafter it might take 5 to 7 days for the package to reach you depending on your location. We accept payments vide Credit Cards, Debit Cards, UPI and net banking only. We do not offer Cash On Delivery(COD) Facility. Only orders that haven’t left our warehouse can be cancelled. To cancel an order, view the order details and tap cancel. Refund for the same will be made within 3-4 working days after deducting bank charges. You may place your orders as a Guest as well but creating an account always comes handy as you do not have to add all your information every time you place an order. If you ever need any help with anything on our website, you may drop us an email on info@atun.in. Our Customer Center number is +91 844708064, we are at your service from 9 AM to 6 PM; Monday to Saturday. 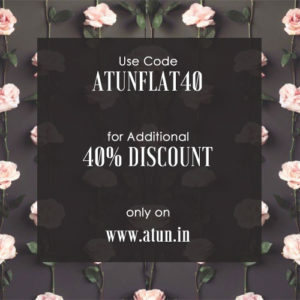 Our online model ensures you can get your favorite ATUN products wherever you are in India but unfortunately we do not have provision for returns/replacements for online orders. So please check the product description, pictures and size chart carefully and place your order.